There are two teenaged girls. Bonnie is the good one. Her parents died young, leaving her to grow up in group homes. One night, she discovers she has extraordinary strength. She uses it to rescue a necklace that a bully has stolen and thrown away from another girl; later, she takes care of the bully. She wants to and practices using her strength to help people. Lola is the bad one, killing her mother, feeling like the world owes her something all the time. She takes whatever she wants – jewelry, clothes, people – not caring about anyone else. They both have super-powers and are basically unkillable. You know how the story goes from here. Well, that’s a hard question to answer. 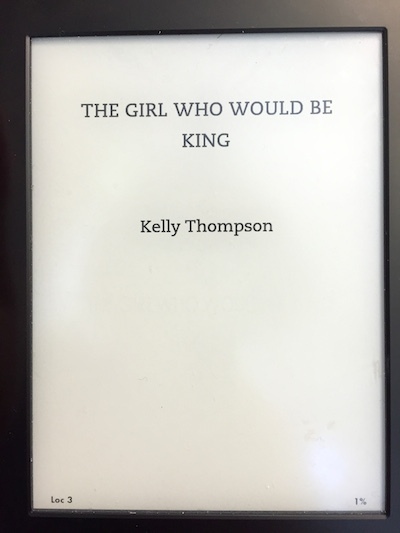 The story of The Girl who Would be King is good. It has lots of action and moves along at a decent clip. The settings are ok – there are a few that are rich, but many are just kind of there. The characters are the same way: a handful of them feel like people, the rest are one-dimensional. So, should you read it? Eh? Maybe? I can’t really recommend it, but I never did want to put it down.